Different Types of Coffeemakers - Which One to Choose? Exploring the world of coffee makers is a challenging venture. The machine you prefer to use remains a very personal decision. It entails discovering different brewing methods, checking out features that can cope with your lifestyle, considering the ideal size and number of servings. Once you do find the right model, it's bound to make a huge difference in your overall coffee experience. You can ultimately craft the perfect cup to enjoy its aroma and taste, whether at home or at work! Learn about the four popular types of coffeemakers and how much goodness it can add to your life. Brewing an entire pot seems wasteful when the rest isn't consumed. That's the beauty of single serve brewers, where every cup can be truly savored. Single-cup machines are sometimes called pod coffeemakers because that’s basically what you use to make coffee. Simply drop your choice of pod into the machine, add water then brew. This type of coffee machine are often modestly priced, but tends to be more expensive to use since pods are pricey compared to buying ground coffee or a bag of beans. 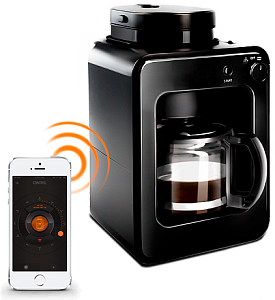 A coffee brewer, often referred to as an automatic drip coffee maker, is a standard in many homes. It's the most common method of brewing coffee that's affordable to buy and use over time since filters are quite cheap. With speed and convenience as main qualities, drip coffee makers are perfect for families, workplaces, and those who frequently entertain. The process is initiated when hot water is poured over finely ground coffee that's placed in a filter, which is best done slowly to bring out the best-tasting cup. Programmable features make it very easy to use, whereas water is sprayed over the grounds in automatic machines. The French press goes by many names- press pot, coffee press/plunger, cafetiere, but altogether works on the same principle. The traditional method lacks modern technology nor does it require electricity, yet never falters to yield the perfect cup that's brewed to your own style. It enhances the flavors and oils in coffee in a very simple and fast process. Just pour in the amount of coffee grounds you want, add hot water at the ideal temperature into the carafe, then press the lid to force the grounds towards the bottom of the French press. Whichever coffee maker you choose, the best way to enjoy your cup of coffee is to try proven tips like purchasing whole beans first. Grind it yourself, right before brewing. More and more people are discovering the amazing freshness and mystical brew that comes from doing it. REDMOND offers a completely self-sufficient machine that does it all - grind, brew, and even call you once your coffee's ready! 23 September 2017 How to Bake a White Bread in a Multi Cooker?